I regularly instruct a yoga class at Akasha Yoga in Jackson every Wednesday at 8:15 a.m. This class, which focuses on balance and is fit for all levels, is called, “Release, Recover & Rebalance.” You may drop in or register at www.akashayogajh.com. The Teton Reiki Circle has resumed quarterly in-person meetings. We gather to visit, share information and practice healing energy in a group circle. All are welcome. This is not a Reiki exclusive event, and is open to all energy practitioners and those interested in healing energy work. It is also a free event, and you may bring food or drink to share or just bring yourself. For more information, write Laura Garrard at attunedhealing@gmail.com. The Teton Reiki Circle will meet next Thursday, April 18 at 6:30 p.m. at 430 S. Jackson Street, the Jackson Holistic Healing Center common room. Those gathering are Reiki practitioners, energy workers of all kinds, and anyone interested in healing energy practice. We will visit, share information and hold a group healing circle. It is a free meeting, and feel free to bring food/drink to share if you wish. Also, we also practice remotely from our individual locations on the last Sunday of every month at 8 p.m.–or if you’re busy in that timing you may place your intention toward that time and day, as with distance practice time is relative. Just focus your intention for universal healing and use energywork, prayer and/or meditation earnestly from the heart. Feeling the result has already come to pass is helpful as we envision positive desired outcomes of peace and balance in our communities and world. Finally, end your session by releasing the outcome to Spirit, God. In that way, we leave our sessions of asking with personal peace in our minds and bodies. Be sure to include your personal intentions for healing in your session, as well as desired requests for loved ones and also those in need. Although we may not be in personal contact with those who need housing or food, those impoverished across our world, our unified participation in prayer is necessary for global and personal outcomes. I have been told, “God doesn’t need our permission to intervene, however He does need our participation.” We are one through Spirit and energy, and so, as we participate we are assisting one another, including ourselves. Thank you in advance for your participation in this remote healing practice. Currently I am teaching one-on-one and small groups on demand. Contact me for more information: attunedhealing@gmail.com. 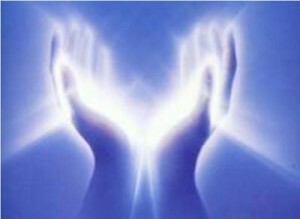 Reiki I ~ Next class will be held Saturday, April 13, 2019 ~ 9 a.m. – 5 p.m. This full day class begins your Reiki learning with the history and definitions of Reiki, an introduction to energy systems in the body, and the Reiki principles. You will become attuned to further open your energetic system and to be able to more strongly give and receive energetic healing. ~$225 fee one-on-one or in a group. Take-home materials and certificate provided. Within Reiki II, you will review Reiki I and receive training and symbols for physical, mental and emotional healing as well as distance healing. After delving deeper into Reiki practice and gathering helpful feedback, you will be attuned. Your certification as a Reiki Practitioner qualifies you to practice Reiki on others. Prerequisite: Reiki I completion. After a brief review of Reiki I and II, you will study visualization healing techniques, learn how to provide a healing attunement, create a Reiki grid, and practice and receive feedback. You will also receive the Master Symbols. Suggestions will be provided about the practical issues, monetary ethics and responsibilities of becoming a Reiki Teacher. You will learn how to give the initiation attunements and then receive your attunements to become a certified Riki Master Teacher in the Usui System. You will demonstrate your skills as your practice on your peers. This certification also includes a 10-hour apprenticeship and the free review of my Courses level 1 & 2. Prerequisite: Reiki II certification. ~ $500 fee per person for a full two days of training plus 2 hours supervised and 8 hours unsupervised apprenticeship. Take-home materials and certificate provided. What a fun night our last class was! Click here to read about and see photos of this event! I and artist Lyndsay McCandless initially collaborated in organizing and teaching this course. Now, I lead this course for special groups and align it with the purpose of those within the group. I also incorporate Reiki to encourage energetic openings during the class. 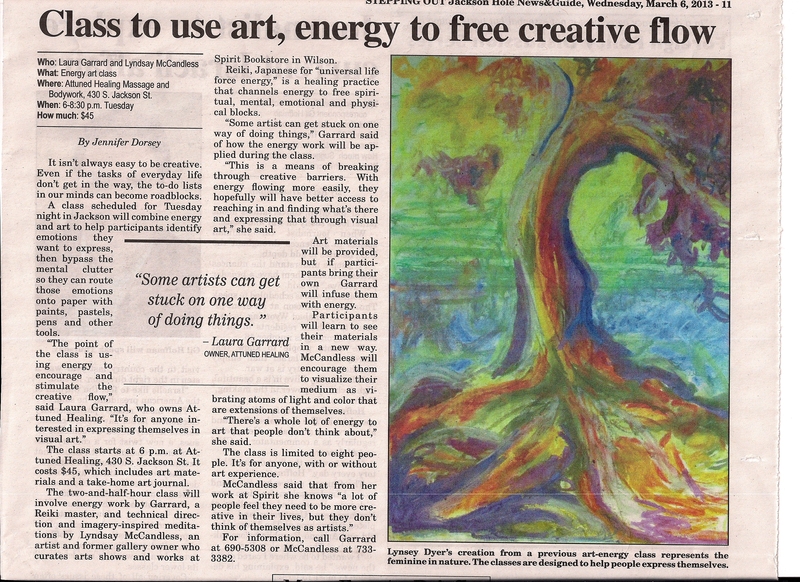 In this class students explore their inner worlds through artistic exercises inspired by energy and create art freely from within. One need not be an artist but an explorer open to the visual world. Materials are provided. Style or skill is not be emphasized; we create from within, and Reiki will assist you in finding your muse. ~$35 per person. Includes materials and mediums.